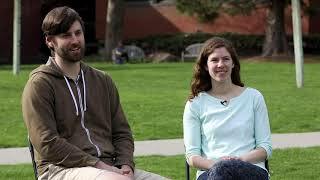 Kate (Pringle) VanDonge '11 met her future husband in the History of Ancient Greece. But it wasn't the battle of Troy or the birth of philosophy that ignited young love. It was the wardrobe of a guest lecturer. "Our visiting professor sent her husband in to sub for her, because they were both experts in various areas of ancient Greece," Kate said. "And he came to class wearing salmon pink jeans." "And a pea-green shirt," said Ben VanDonge '09. "It wasn't just the salmon pink jeans. It was that it was offset with the pea-green shirt." "It was the full watermelon look," Kate remembered. "It was great. And we hadn't talked to each other up to that point in class, and we struck up a conversation. And it kind of went from there." Two weeks after Kate graduated from Whitman with a major in English and minor in astronomy, the couple got married. Their story of connection and relationship encapsulates one of the things that makes the college so special, the couple said. And it's one of the reasons they continue to support the college through scholarships, as well as other programs. "The No. 1 connection that we maintain with Whitman is actually just our friend group and the community," Ben said. "Our closest friend group, 10 years later, is still the friends that we made while we were here, and friends we've made who have graduated after us, and before us as well." Ben majored in history and minored in education and today teaches fifth grade at Sharpstein Elementary in Walla Walla. Originally from Walla Walla, Ben said that he was a fifth grader himself when he declared he was going to go to Whitman and become a teacher. The door was opened by the Murr Scholarship, which was available to students who graduated from Walla Walla high schools. "My family was very excited about that," Ben said. "Without that scholarship, I don't know that I would have been able to have been here for all four years." Kate grew up in the Seattle area and was attracted to Whitman because of the quality of the education it offered and the proximity to home. "I was really excited when my financial aid package came and I had enough scholarships and loans and work study to come together and make this possible," said Kate, who also participated on the Blues swim team. They stay connected to Whitman through giving, their fellow alumni, and dropping in on campus events. Ben also tries to offer current students opportunities to have the outside-the-classroom experiences that make education come to life. "I always try to get as many Whitman students in to my classroom as possible," he said. He has students come in for America Reads America Counts, to serve as mentors, and he tries to always participate in Whitman Teaches the Movement. "It has been wonderful to stay connected to students in that way. I had a student in my room this year who, we figured out that we actually lived in the exact same room freshman year, but just separated by 12 years." As a student, Kate was a participant in America Reads America Counts. "I was one of those students. That was one of the ways that I used my work study," she said. "It was a really great year of networking with different teachers at an elementary school and learning about what it's like to be a professional adult." She also worked in the Office of Financial Aid, getting a first-hand look at the difference that scholarships make in students' lives. "It was a really cool way to learn about how that works in college, and how much our community at large relied on the benefit of various scholarships and donations," she said. Find out how you can make a difference to students through giving.